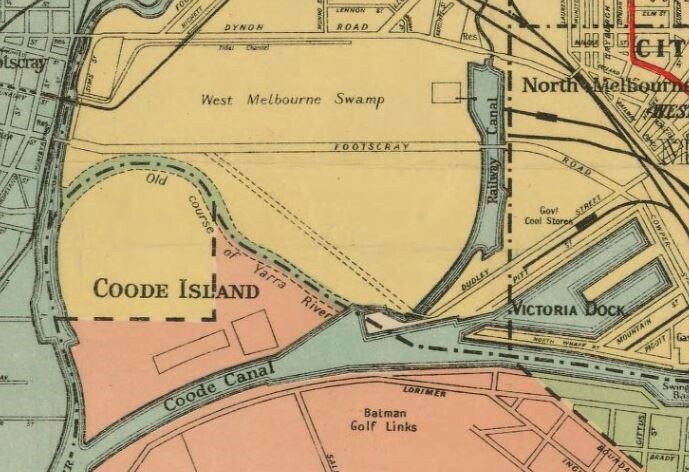 Former creative fellow and author, Dr David Sornig, shows us how the library’s maps and manuscripts chart the demise of West Melbourne’s wetlands in his special guest blog this week. The 8 square kilometre zone to the immediate west of Melbourne’s CBD is today dominated by its industrial, transport and urban uses: from the Docklands redevelopment through to the Bolte Bridge, Appleton and Swanson Dock, the network of freight rail yards and the recently-vacated wholesale markets. But for thousands of years the area was part of a fertile wetland whose most striking features were the meandering north-west course of the Yarra River and a large blue saltwater lagoon. The story of the area’s radical transformation over the 181 years since Melbourne was founded – and perhaps why it has never quite found a comfortable place in the public imagination of the city – is revealed through the library’s collections of maps and manuscripts. While Melbourne grew rapidly in Batman’s wake to become an important centre of finance and trade, the lower reaches of the Yarra and the lagoon came to be viewed as a barrier to progress. A difficult-to-navigate stretch of the river was known as Humbug Reach, notorious for becalming – or ‘humbugging’ – trading and passenger ships, sometimes for days at a time. 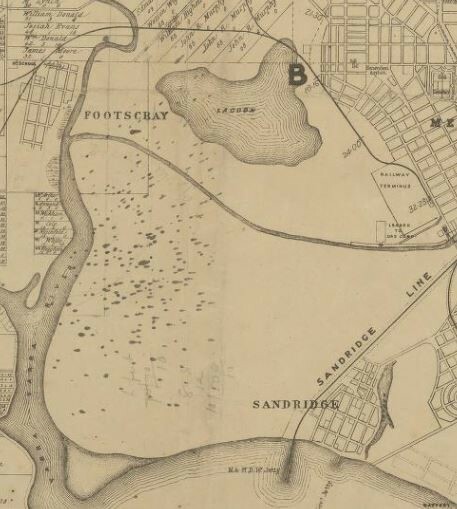 The lagoon, which was referred to variously as Batman’s, West Melbourne or North Melbourne Swamp, was ringed by slaughterhouses and boiling-down works that took on the job of reducing the colony’s near endless stream of slaughtered sheep and cattle. 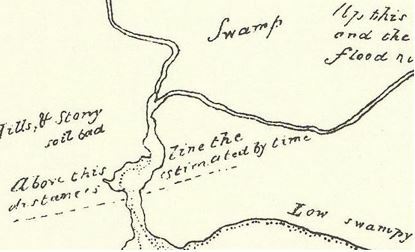 By 1873, the Victorian Government’s Royal Commission on Low Lying Lands  had recommended doing away with the ‘repulsive aspect’ of the area, including the swamp, through a program of drainage, reclamation and improvement. 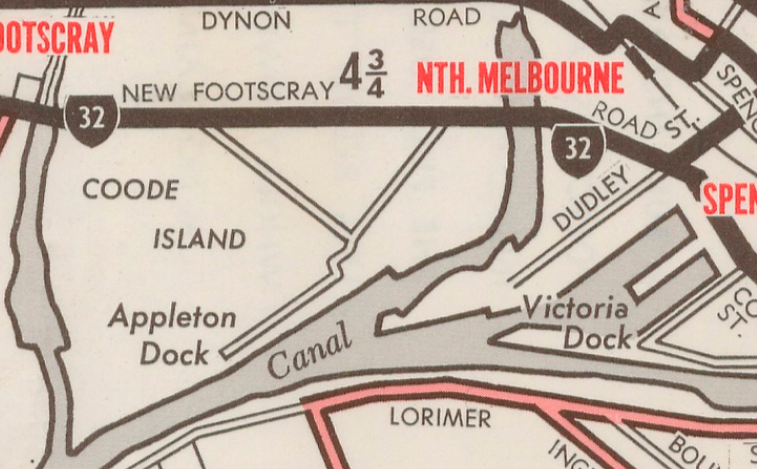 And by the end of the decade, the Melbourne Harbour Trust had Sir John Coode draw up plans to divert the difficult-to-navigate course of the lower Yarra into a wide, deep canal along a direct course from the city to the river’s mouth. Coode also set in train the dredging out of the eastern end of the zone to form the city’s main harbour – Victoria Dock. Together, the canal and the old course of the river formed Coode Island and became home to the Bubonic Plague Sanatorium and the Animal Quarantine Station. A second canal was dredged to the north for the delivery of coal to the rail yards and beside it was built the sanitary works, which were intended to deal with the vast volumes of night soil from the city’s still-unsewered streets. Scattered through the area were any number of official and unofficial rubbish tips that were used by the surrounding municipalities, the Victorian Railways, the Melbourne Harbour Trust and private citizens. Given its isolation, and the opportunities it presented for picking the tips, the area came to attract through first decades of the twentieth century a scattered number of hermits and itinerants who made homes out of scrap. By the early 1930s, when the Great Depression put thousands of people out of work, a full-blown shanty town grew up either side of the Railway Coal Canal. Known as Dudley Flats, it served for the best part of a decade as a place of refuge and subsistence living for as many as a sixty people at a time. By the middle of the century the Dudley Flats settlement had largely ceased to exist, with only a few men sticking to their lives on the tips. 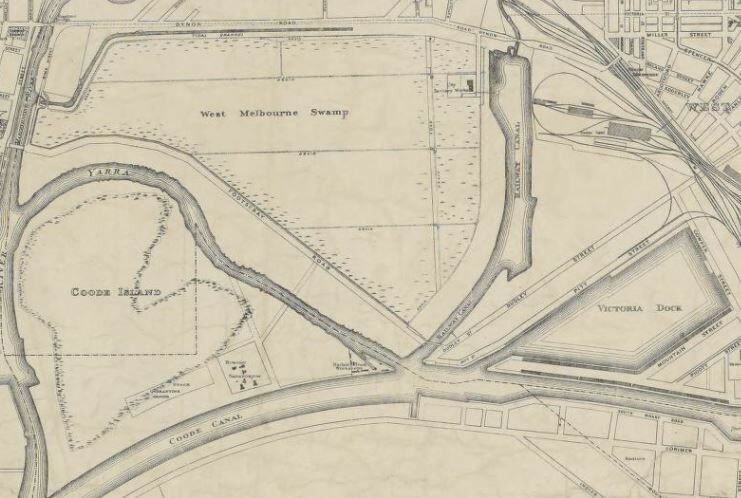 Barely any trace remained either of the silted-up original course of the Yarra as the docks and railway yards encroached further into the area. Through the 1950s and ‘60s the tips were closed, the wholesale markets were built on the north side of the new Footscray Road, and an enormous slice of Coode Island was carved away with construction of Swanson Dock. By the 1970s any last trace of the wetlands, the lagoon and original course of the river disappeared from the maps completely. Sarah is a librarian in the Victorian & Australian Published Collections Team, Collection Discovery & Development Division. (Further to the above Comment). Childhood impressions (from 1950s) of the lower reaches of the Yarra River, the Melbourne wharves, the flat land around Dynan Rd which comprised the old tip area (once announced by the sea gulls ever circling above), the old car punt crossing to the Western suburbs, and even the more recent views ‘snatched’ whilst driving across the West Gate Bridge, have all been like separate parts of a jig-saw puzzle I could never put together in my mind as an integrated landscape – until today – when I read David Sornig’s paper and studied the associated maps and documents held within in the SLV Maps and Manuscripts Collections. The resolution of ‘one of life’s mysteries’ affords me both satisfaction and I suppose ‘closure’, now that the once ‘unknown’, becomes the ‘known’. I am left wondering though, why I never resorted to the Melways or a fold-out tourist map of Melbourne’s west, which might have contributed sooner to a more integrated understanding of that flat and puzzling landscape, so transformed from its natural state, by the intervention of industrialized man. Anne, your comments have much resonance. My father was a shipping agent, and had a bond store in the area off Footscray Road in the 60s and 70s. Even spending lots of time down there, it was difficult to figure out exactly the context of this area in terms of broader Melbourne. The area always fascinated me, and on the weekends when we often visited, it always had an eerie and desolate quality. I enjoyed reading you impressions. Provides a fuller understanding of the natural state of the landscape, and changes brought about since settlement in its provision of resources and services for its inhabitants. Thanks for making this information more widely known; I have been interested in the subject of wetlands for a while, more particularly in the ways in which wetlands have been seen at different times, and within different social contexts. I’m intending one day to write a major study on Melbourne’s vanished wetlands. I’ve been gthering material and thinking about it for a while. 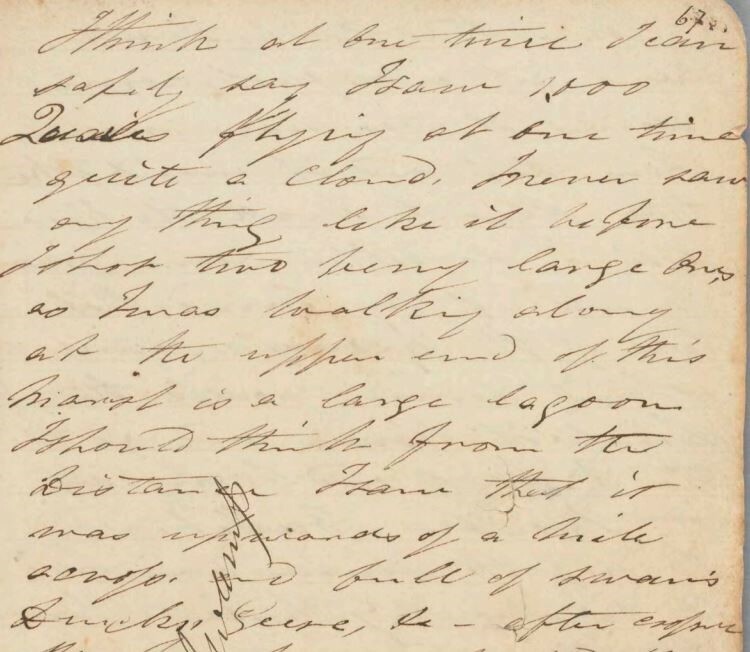 So far all I have published is a brief article in The Victorian Naturalist, vol. 131, pages 96-105, 2014. I remember getting the fright of my life when, as a 14 or 15 year old, digging bottles at Dudley and we came a poor homeless guy who had set up a shanty in about 1974 or 1975. He wasn’t there for long, but would have been more of an isolated case rather than the pandemic as discussed in the article.